Your perfect day deserves the perfect venue. Welcome to 4 Points Farm in the Smokies. We open up 10 acres of our farm for both your ceremony and reception. Our custom 4000 square foot heated and cooled venue provides every amenity you could want- from a gorgeous bridal suite, to custom speakers and 7 foot chandeliers. 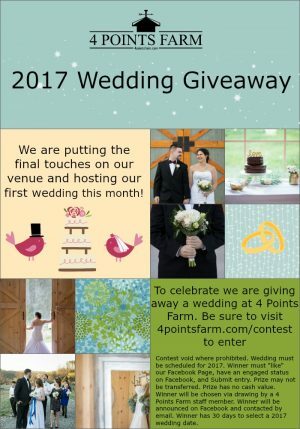 4 Points Farm is handicap-accessible so the most precious members of your family can be included in your big day. Tables, linens, indoor and outdoor chairs are available at the barn for no extra charge- saving you thousands in rental fees. We are newly opened to the public and to celebrate our first wedding this month we are giving away a wedding rental. Use the form below to enter and keep an eye on Facebook for updates and announcements! Good Luck!